The IMF today released its Article IV assessment of the Euro area, so as usual, I will be blogging on the issues raised in the latest report throughout the day. The first post looked at debt overhang, while the second post presented IMF views and data on the euro area banking sector woes. The third post covered IMF projections for growth. 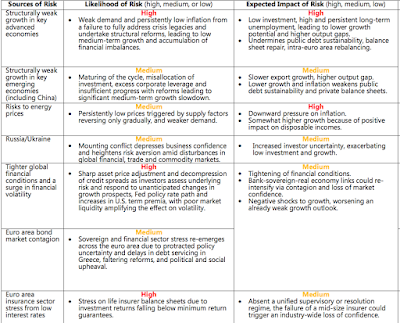 So let's take a look at the risks to the IMF's 'growth returns to Euro zone' scenario. slowdown in emerging markets, geopolitical tensions, and financial market volatility, whether due to asymmetric monetary policies or contagion from events in Greece." 1) Eurozone has no real drivers for current growth uptick (which is weak to begin with). Instead, all it got to brag about are: QE (extraordinary monetary policies); QE-induced weaker euro (beggar thy neighbours trade policies), some rising confidence (hopping mad global asset markets bidding everything up on foot of global QEs - extraordinary policies); and lastly - lower oil prices (that sign of global economy on a downward slide). Congratulations to all - hard work and enterprising are not required for this sort of growth. 'financial market volatility' (wait: what on earth have we been doing since 2007 other than fight the said financial markets volatility? Looks like lots of successes here, if the said volatility is still a risk), 'whether due to asymmetric monetary policies' (in other words, if the Fed hikes rates too early too fast) or 'contagion from events in Greece' (would that be the same Greece that has been ring fenced and repaired? most recently this month?). Now, recall that some time ago I said that the next step for Europe will be a fiscal / political union with less democracy for all and more technocracy for the few? (link here). And IMF does not disappoint on this too. "Beyond the near term, there should be a concerted effort to accelerate steps to strengthen the monetary union and European firewalls. Fully severing bank-sovereign links would require a common deposit insurance scheme with a fiscal backstop, a larger and fully funded Single Resolution Fund, and easier access to direct bank recapitalization from the ESM. The greater risk-sharing implied by these measures should be underpinned by a strengthened fiscal and structural governance framework which could require possible Treaty changes. These reforms are desirable in any case, but accelerated progress could help bolster market confidence in the face of recent events." What have we learned from the above? Why, of course that the frequent claims by the EU officials that Europe now has fully severed contagion links between banks and taxpayers are… err… a lie. And that common claims by the European officials that we now have a genuine monetary union infrastructure is also a lie. And that to make these two claims not to be a lie we will need something/rather that requires 'possible Treaty changes'… which is of course a political and fiscal union. So kiss that national sovereignty and self-determination bye-bye… assuming you still believe such exist in the Euro Land. 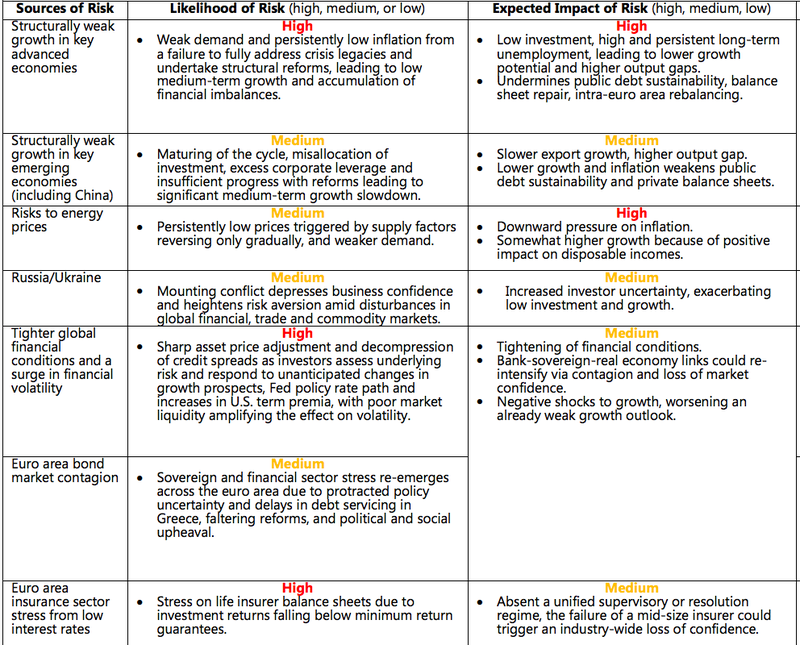 Now, do some counting: out of 7 key risks, four have either high probability of occurring or bear high impact if they should occur or both. Now, all of the above still generates a positive outlook under the IMF forecasts - positive, meaning GDP growth over 1.2-1.4 percent, never mind GDP growth anywhere near that of the U.S. But then the IMF goes slightly gloomier and paints a "Downside Scenario of Stagnation in the Euro Area". Here we are getting some traction with highly probable reality by the highly diplomatic Fund. "Subdued medium-term prospects leave the euro area susceptible to negative shocks. A modest shock to confidence—for example, from lower expected future growth, or heightened geopolitical tensions—that lowers private investment could affect households via labor income and wealth. Expectations of lower inflation at the zero lower bound would keep real interest rates high. 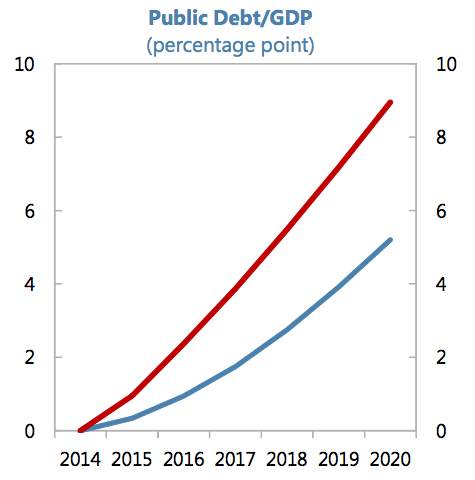 For countries with high public debt, risk premia could rise, amplifying the shock and raising the risk of a debt-deflation spiral. Policy space would be limited with short-term interest rates at the zero lower bound and public debt high in countries with large output gaps (Bullard, 2013)." Currency devaluation policy is not an option in the monetary union dominated by Germany. Welcome to Hope Street where things can only go as smoothly as today, forever. 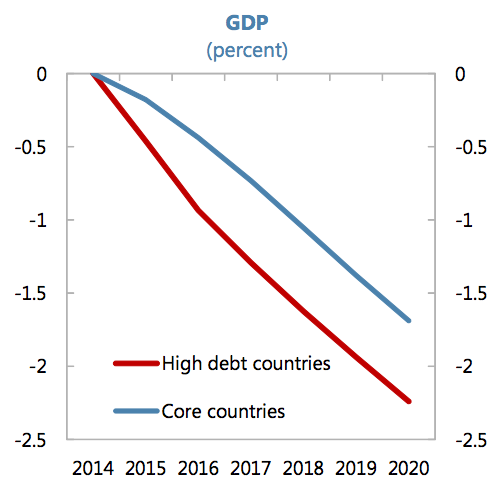 "An illustrative downside scenario, assuming lower investment for all euro area countries and increased risk premia for high debt countries, suggests that euro area output could be nearly 2 percent lower by 2020." Guess what: 2020 forecast growth is 1.5% (link here) which means that IMF is saying it will be -0.5% aka another recession. "The main channels would be through higher real interest rates depressing investment and consumption as well as lower inflation and wage growth constraining adjustment within the euro area." 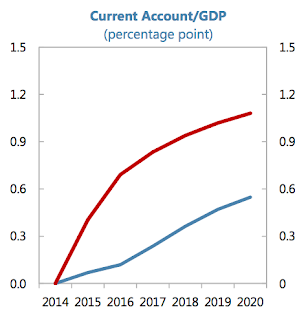 Which means IMF is now fully buying into the Secular Stagnation (Demand Side) scenario I wrote about here. "The impact would vary across countries with real interest rates higher in countries with weaker balance sheets. 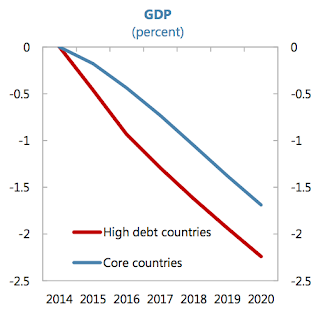 Fragmentation progress would reverse and public debt would increase more in high debt countries due to lower fiscal balances and nominal output. “Bad” internal rebalancing would follow, as current accounts in high debt countries would rise due to import compression. Lower inflation would worsen external imbalances, by forcing countries with large output gaps and imbalances to adjust through lower prices and employment."